Looking for a unique gift idea this year? – the history of their family or their home. 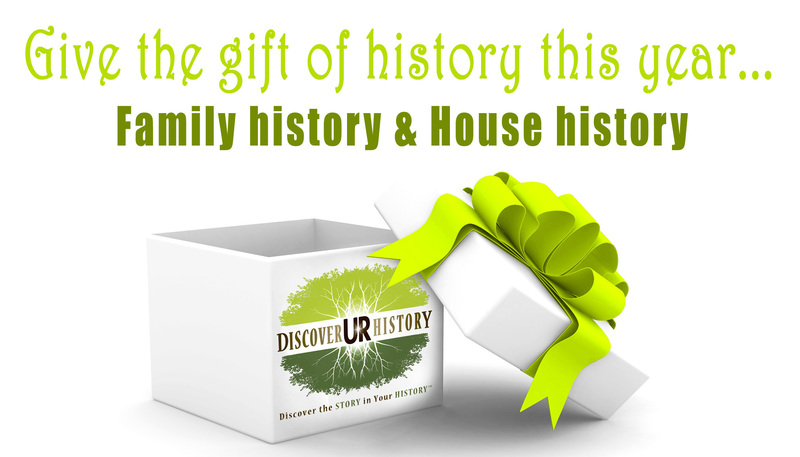 DiscoverURhistory is now offering gift certificates!! Our researchers can discover new details on your FAMILY HISTORY through census records, city directories, vital records, newspaper articles, obituaries, cemetery inscriptions, etc. You can learn where your ancestors came from, where they lived and how they died… look for that long lost relative or dive into that family legend passed down for generations. In HOUSE HISTORY projects, we can discover a wealth of information on the previous owners of your house. We delve into deeds, census records, city directories and newspapers to provide answers like when your house was built, who used to live there and what might have happened in the house over the years… births, deaths or even a marriage or two. All research projects include a detailed report on our findings along with copies of all documents we discover. $100.00 minimum purchase for gift certificates. Terms and Conditions: Gift certificate cannot be redeemed for cash and has no cash value. If you authorize research beyond the value of gift certificate, that research will be billed at the normal hourly rate of $35.00 per hour. Gift certificate does not cover potential out-of-pocket expenses including certificates/vital records fees, photocopies, postage, microfilm rental fees or other necessary expenses. Gift certificate cannot be combined with any other offers, sales and/or promotions. DiscoverURhistory is not responsible if gift certificate is lost, stolen, destroyed or used without permission – no replacement will be provided in these circumstances. Sale or resale of gift certificate is prohibited.